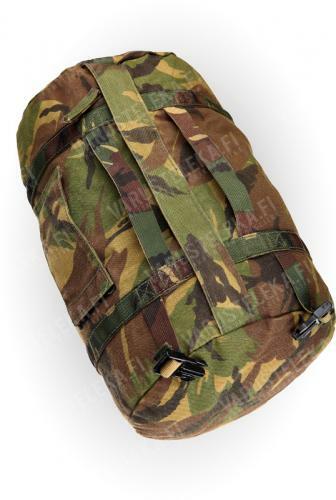 Small duffel bag that fits about 15 litres. Most likely intended to be used with backpack or combat vests, and can be attached to anything with general purpose straps. The size and shape resembles a large sleeping bag. One zipper length-wise on the side to access the inside. The bottom has a large carrying handle and the side has two smaller ones. Two male plastic buckles are found in one end, so it's obviously designed to be mated with other Dutch gear. With this bag alone they serve no purpose. 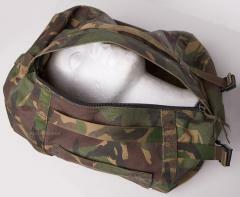 In the Dutch army this piece of kit is called "RoTo Tas", which refers to Ronnie Tober, "tas" being Dutch for "bag". Made of tough, water repellent synthetic fabric. Weighs about 400 grams, that should tell something about the material strength. If you don't trust normal compression sacks for sleeping bags, try this! Sopivan kokoinen sidottavaksi BW-jääkärirepun päätyläpän D-lenkkeihin. Pomminvarma pikkupussi. Kestää ja kestää, ja pitää vettä. Myös sisällään, jos sitä sinne jotenkin joutuu. Eli hikiset sukat kannattaa kantaa muualla, ellei halua supikoiransyöttiä tehdä kassissa. Mine came almost like new, only with a few markings. This bag is kind of stiff and is made to be abuse; perfect for tools and odd stuff. My jungle sleeping bag fit in it without a problem with some space to spare. The 2 male 1" buckles are made to fit with the patrol rucksack sack (I got 2 of them; OD and DPM) or any compatible gear so you can carry more stuff with a more balance weight distribution and drop it easily when needed. I don't know if the 1" split buckle are compatible with this bag but if it can, you can turn yourself into a glorified mule with any rucksack. Toimii aivan kaiken tavaran rahtaamiseen, jos vaan "suusta" sisään sopii. Toimii hyvin brittiläisen DPM-kuvioisen 30-litraisen partiorepun lisäpussina jo värinsäkin osalta. Tämän avulla minimalisti kantaa repussa jo viikonloppureissun vermeet ja muonat ainakin kesäkelillä. Very useful to keep things organized in my car trunk. One for the food and stove, one for the tent, one for the tools and extras. I even leave them outside the tent as I know they will keep the condensation and rain out. Get a couple, once you start realizing how convenient and sturdy they are you will want to get some more. 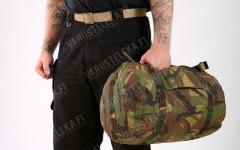 Durable little duffel bag. Should have bought a couple.